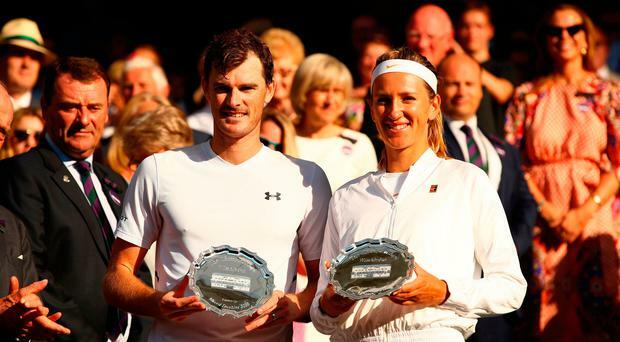 Jamie Murray was denied back-to-back Wimbledon mixed doubles title after he and Victoria Azarenka lost a hard-fought final on Centre Court. The Scot and his new partner were beaten 7-6 (7/1) 6-3 by Austrian Alexander Peya and American Nicole Melichar. Murray, who won 12 months ago with Martina Hingis, had not initially planned to play in this year's mixed event, instead deciding to focus on the men's doubles with Bruno Soares. But when the chance to partner Belarusian former world number one Azarenka arose, Murray jumped at the opportunity. Murray and Azarenka found themselves under severe pressure in the first set, eventually holding serve in a marathon seven-deuce game for a 4-3 lead. They managed to force a tie-break, but the 11th seeds swept through it to take the lead. Murray and Azarenka had fought back from a set down twice before to reach the final, but they could not mount another comeback as hopes of British success disappeared. "I didn't really return well enough, didn't feel I served that good either," Murray (32) said. But the opportunity to partner two-time Australian Open singles champion Azarenka (28) persuaded him to take part. Wimbledon's total prize pot was raised to £34m in 2018. There were prizes of £2.25m for both the men's and women's champions - and there were new rules to discourage players from competing while carrying an injury. Last year the tournament was hit by a spate of players withdrawing early into their first round matches so that they didn't miss out on their prize money. However, players who go into matches this year with a pre-existing injury ran the risk of being fined up to 100% of their prize money if Wimbledon believe they should not have played. Here's everything you need to know about prize money at this year's Championships. The Gentlemen's and Ladies' singles champions took home £2.25m this year. The runner-up got £1.125m - exactly half what the winner earned. The Gentlemen's Doubles and Ladies' Doubles won £450k, an increase from £400k in 2017 and £350k the year before. The Mixed Doubles champions earned £110k, an increase on the £100k handed out to the 2015, 2016 and 2017 winners. Those players knocked out early at this year's Championships actually enjoyed a much greater share of the prize pot: an overall 7.6% of the total amount, bringing it to £34m. In the Gentlemen's and Ladies' Singles, first round losers received £39k - an increase of 11.4% from the year before.